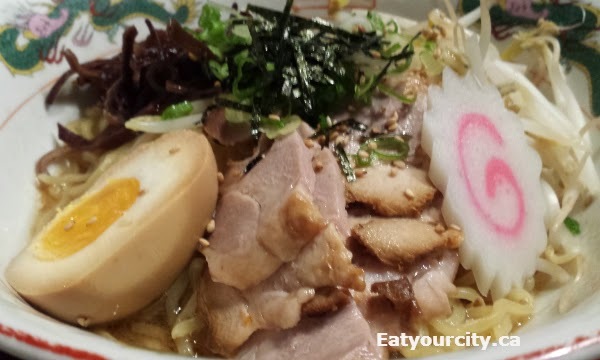 Posted by We were craving ramen, and we had to be in the Richmond area, so it didn't make sense to drive into downtown Vancouver to eat at Santouka or Kintaro, so we hit up Nan Chuu Ramen Izakaya instead. Run by the same folks as G-men, we figured their ramen should be tasty! It looked promising as within several minutes of them opening (we missed the boat as we were circling for a parking spot), there was a huge line up out the door. I'm not sure if its a given at ramen places in Vancouver, or if its just coincidence... if its not a cool day, out prepare to sweat bullets as none of them seem to have a/c! Anyhoos, onto the ramen!! While the entrance is narrow, there is surprisingly a decent amount of seating in this long, narrow restaurant. I initially wanted a nice big hot steaming bowl of ramen - but after baking in the heat waiting for a table, I was super tempted to get the Hiyashi Chuuka, a cold soupless noodle bowl, but as I wanted to try their soup base, me and V went with their not so aptly named Special "soupless" noodle which actually has a small amount of tonkotsu shoyu soup and toppings. 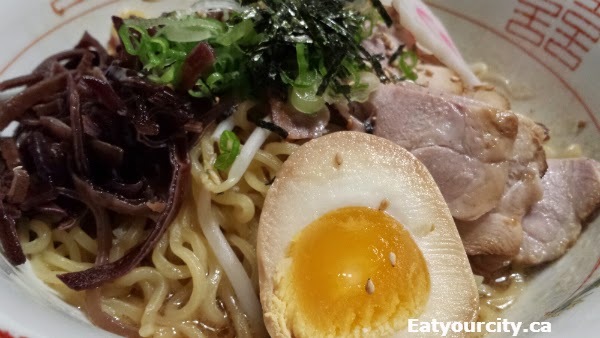 I was super tempted to try the Miso Cheese Kimchee Ae Soba a try, but I was here for ramen! The tonkotsu shoyu broth was rich, salty and savory.. so rice and salty, I was glad my bowl only came with a small amount of broth. The noodles had a nice springy mouthfeel, and there was a good number of toppings - soft boiled marinated egg, bbq pork, blackwood ear mushroom (nice earthy crunchy crisp textural element), green onions and bean sprouts to round out the bowl of ramen. We wanted to try their Izakaya grilled items, but sadly, the Izakaya menu wasn't offered during lunch, only dinner time. The boys ended up both getting a Torigara Shio ramen - Chicken soup flavored with shio (salt sauce) as strangely during lunch there was no choice for a regular tonkotsu broth ramen - unless you like it spicy and have peanuts added to it. The chicken broth base (a less touted and seen soup base for ramen in Japan) has notes of ginger, and resoundingly shouts Chinese flavors rather than the usual miso, dashi or konbu. 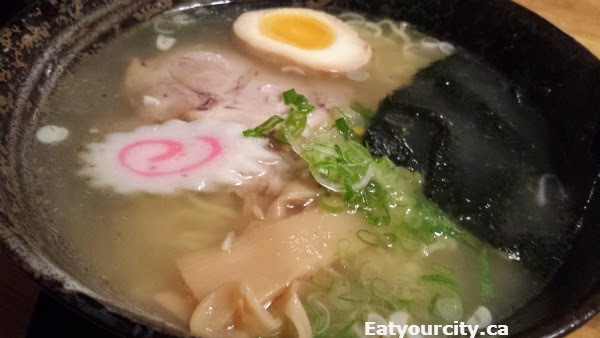 The mild broth is quite salty and has notes of ginger and green onions, and missing the richness that is inherent in tonkontsu (pork and sometimes pork and chicken based) broth. It was a very light and bit oversalted ramen, but tasty none the less. 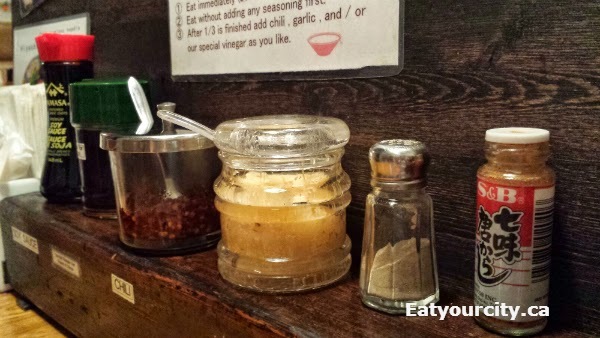 There are condiments on the side that you can add to your ramen if you like, along with amusing instructions to eat some of your ramen the way they make it first, then add condiments to your liking and eating yet again. 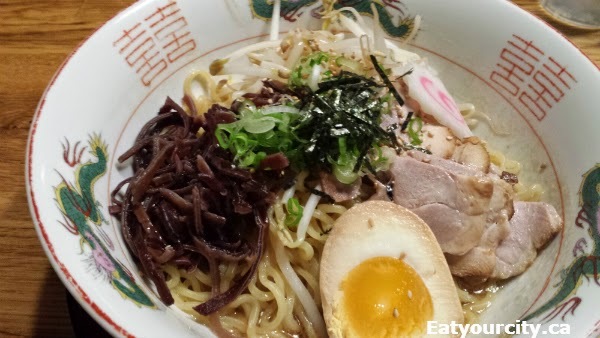 If you're in the mood for fusion style ramen, head here! Service was pretty slow, and the broths on the saltier side, but I think I'll give the Miso Cheese Kimchee Ae Soba a try next time!